glossary: xxxxH is a time in 24-hour clock, if six-digit the first two are date. YSxxxxxx is a 6-figure map grid read left to right then bottom to top. KIA killed in action - WIA wounded in action - BT blood trail full glossary here Rain fall figures are for NUI DAT. Research Issues. 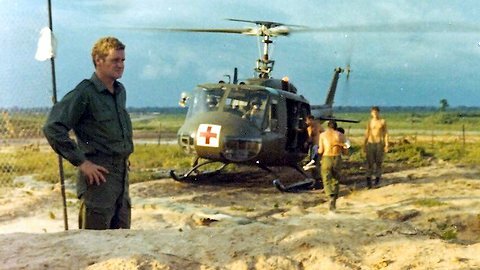 It is disappointing that the 8RAR commanders diary and some contact after-action reports for the period 9 - 22 September 1970 are not available on-line. 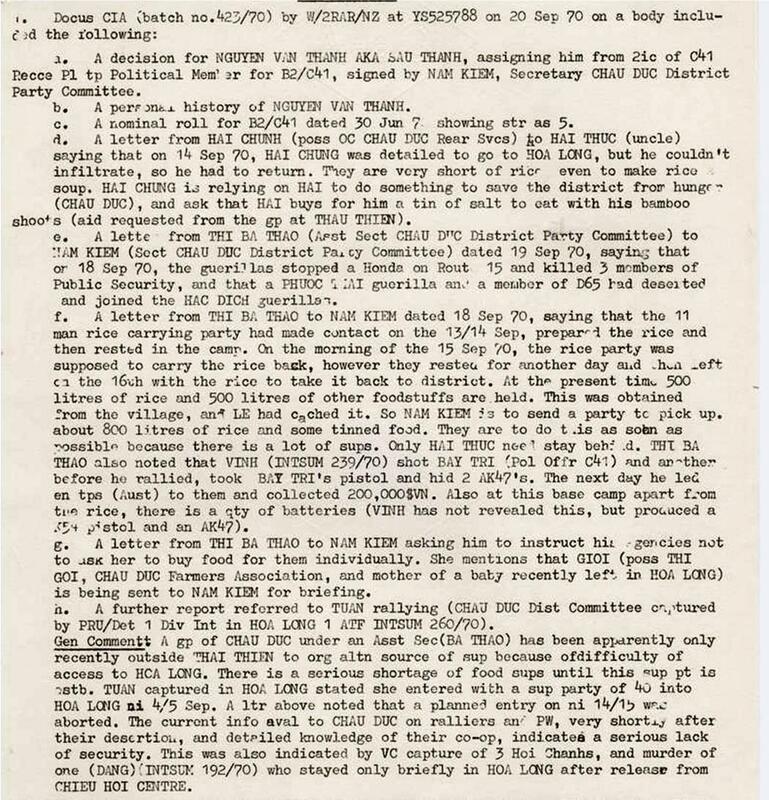 The 2RAR logs available are hand written, generally messy to read and difficult to understand. 2RAR/NZ did not keep a CO's log while absent from operations between 11 and 21 September. If the missing records do exist please advise their location. Many gaps in the timeline have been filled by using detail reported by 2RAR/NZ and 8RAR to the 1ATF CP. The 2RAR/NZ logs in their unedited state do offer some insights into unit operational thinking. Summary. 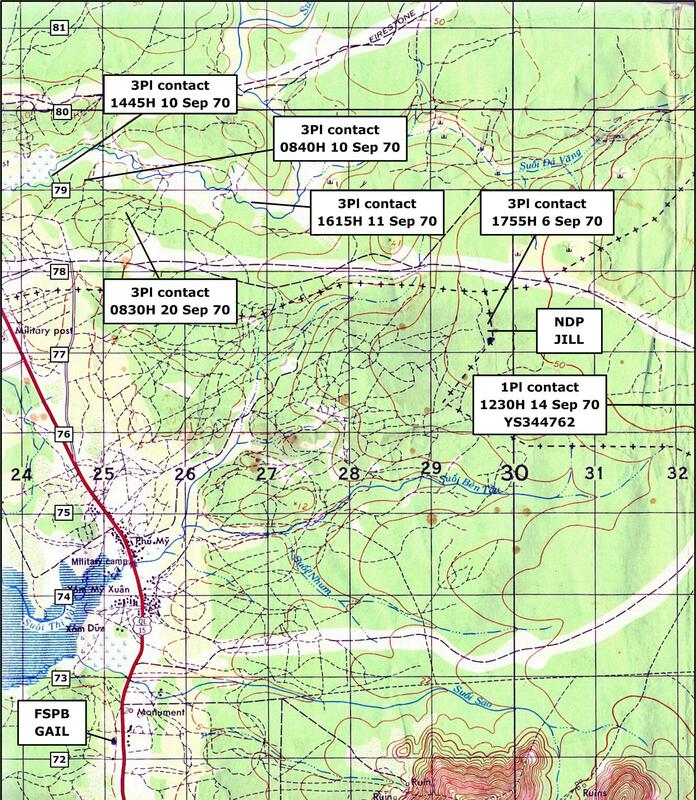 At the beginning of September 2RAR/NZ Bn HQ and 107 Bty RAA were located at FSPB GAIL [YS252722] while the rifle company's operated in the hill area and jungle north of SHW15 and west of NUI DAT. The land clearing team [LCT] from 17 Construction Sqn RAE supported by three tanks and a section of APC operated from NDP JILL YS298771 [established 28 August] to the north of the NUI THI VAI, NDP JILL and the LCT being protected by an infantry company. 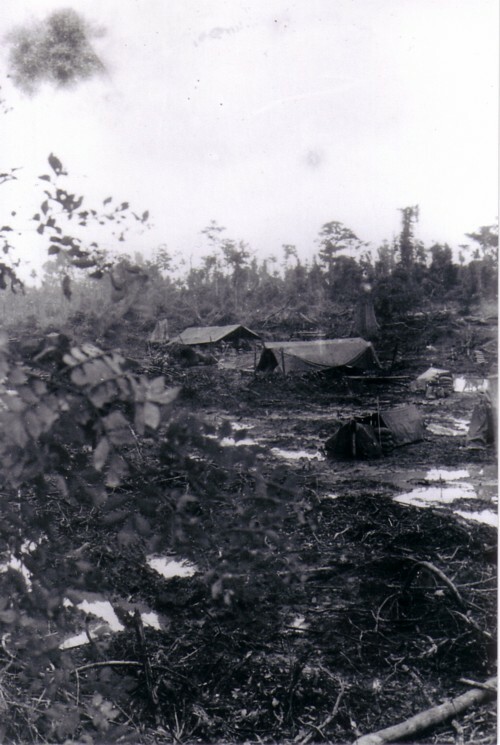 The LCT comprised large earth moving plant engaged in stripping out the jungle in a wide path to present an obstacle across which the VC had to cross and from where they could be seen or tracked. In a typical day the LCT might clear 50-60,000 square metres of jungle, their total for September being 700 acres. Protection of the LCT required the infantry to interdict VC tracks and discourage mining. NDP JILL became a FSPB on 29 September with the arrival of a section of guns from 107 Bty RAA, meaning that at times around 200 personnel were directly involved with the protection and support of the LCT operation. W Coy was assigned as the LCT protection company on 31 August. 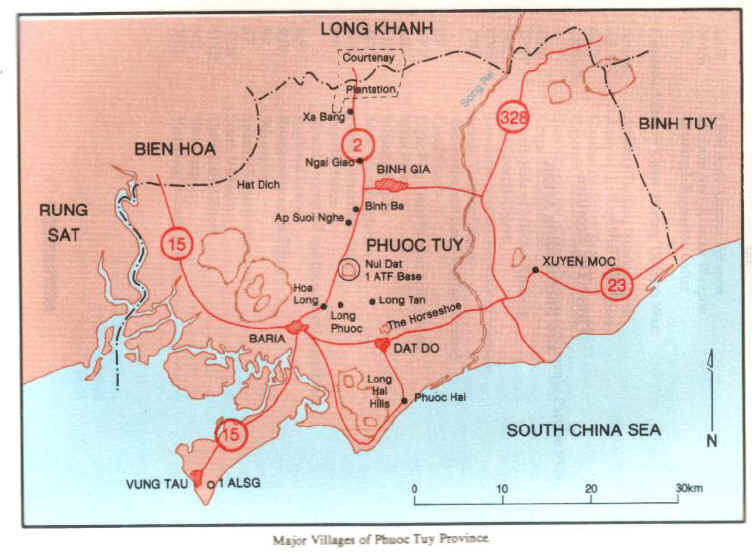 Initially deployed in a rough line running west-east north of the mountain mass, 3Pl were closest to SHW15 and the villages needing protection, 2Pl were in the middle and 1Pl to the east near the SUOI CHAU PHA river, but one platoon always rotated to protect NDP JILL and the LCT. After 10-days 2RAR/NZ withdrew back to NUI DAT for rest and retraining leaving W Coy with the LCT minus 2Pl deployed as garrison at FSPB GAIL, 8RAR again having OPCON of W Coy. 3Pl led by Sgt Joe Yandall [picture right] were particularly successful with four contacts during the period 10 to 20 September which resulted in five (*) VC KIA without any 3Pl casualties, these actions were mentioned in the citation for MID awarded to Sgt Yandall in November 1970. After 2RAR/NZ returned to AO MANGO on 21 September W Coy finished with the LCT and returned to NUI DAT for their final 2-day break at VUNG TAU, followed by a period in NUI DAT as the 1ATF Ready Reaction Company. (*) there is a discrepancy between the citation [8 VC KIA] and the after action reports [5 VC KIA] for the period between 10 - 20 September. 2 - 4 Sep: area YS47-67 to YS48-67, departing 1630H and returning 0830H. [there were likely to have been other patrols]. 0930H at YS289778 3Pl was waiting for an engineer [holdfast] to be flown in to their location by 'Possum' [Sioux 2-seater], task not given, there is comment in the 2RAR log about a 'holdfast group'. 1155H at YS299768 the engineer mini-team with 2Pl located a cache on top of the ground. The cache was 2-3 weeks old and had x1 AK47, x1 RPG with x7 rockets, x5lb rice and med supplies and documents. Intelligence suspected it had been left from a contact on 21 August by 5Pl B Coy. 1545H locstats 1Pl(-) YS306768, 2Pl YS298779. Contact: 1915H W Coy at NDP JILL YS294771 mortared x2 VC observed by a sentry 150m west of the perimeter. A sweep the following morning found nothing of interest. Locstats for W Coy at 0830H were: Coy HQ, 3Pl, APC and tanks at NDP JILL. 1Pl YS308764 and YS307768, 2Pl YS296791 - a civilian access area. 2Pl were designated from 9 September to garrison FSPB GAIL. 1658H 2Pl were standing by for a Possum to fly Pl Comd to NDP GAIL for handover, Lt Upton remained at GAIL overnight and returned to 2Pl late afternoon 7 Sep. Contact: 1755H [almost dark] at NDP JILL [YS299774] a 3Pl sentry sighted x6 VC moving on the edge of a clearing 250m away. A clearing patrol from 3Pl was sent to check the area and the patrol lead scout observed a VC and opened fire at 30-metres, the remaining VC scattered. 3Pl returned to NDP JILL rather than try to track the remaining VC in darkness. A sweep the following morning found nothing more of interest. 1850H in the same area YS299774 3Pl engaged suspected VC movement with mortars and M60 fire no result. 0817H W Coy HQ advised Bn HQ that they had a broken radio and were shutting down the air/admin net - Bn HQ did not react...! [see comment 26 August]. The AA net was opened again at 0910H. 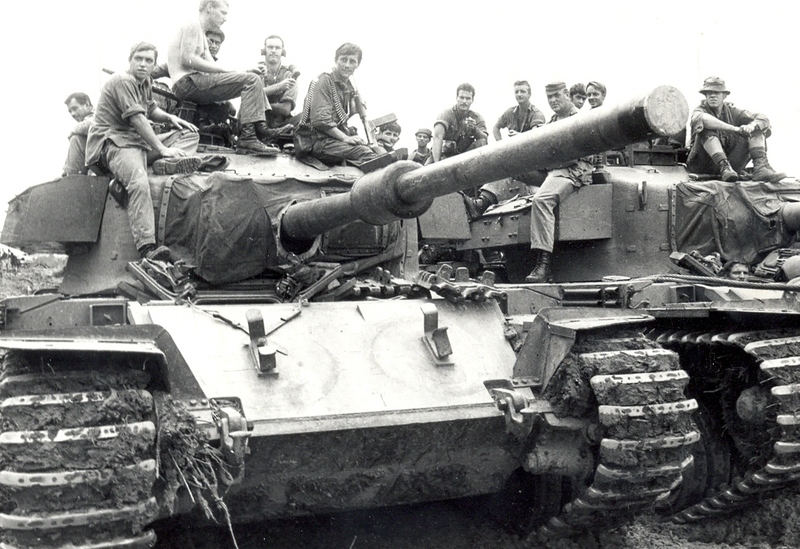 1002H Bn HQ queried the strength of 2Pl for their move to FSPB GAIL, answer 28 personnel with PZ at NDP JILL. 1647H Bn HQ confirmed the details of 2Pl move to FSPB GAIL as starting 1300H 9 September - 2Pl [four sorties, 28 pax] would be joined at GAIL by V Coy mor sect c/s84 flying from NDP JILL at 1330H [three sorties, 8 pax, 2 mor, 1000lb ammo]. W Coy mor sect replaced c/s 84 at NDP JILL. 1201H 3Pl were waiting at a LP with tanks [c/s T4] at YS285782. 1300H 2Pl airlift started, 2Pl were airborne at 1310H and complete at FSPB GAIL at 1321H. At 1600H 2PL switched command net to 8RAR internal as c/s7, W Coy HQ still at NDP JILL also switched but remained as c/s5. 0830H Brig RM Gurr commanding 28 Commonwealth Bde in Singapore arrived in 1ATF to visit NZ units [departed 1400H same day]. He was met on arrival by Comd 1ATF and Maj Taylor RNZIR 2ic 2RAR/NZ. Brig Gurr visited 2Pl at FSPB GAIL at 0945H. [another date may be 12 September]. During the morning W Coy HQ erected a 292 radio aerial in an attempt to improve communications with 8RAR, but only average comms were achieved and the Coy HQ sigs continued to make changes to improve the link. 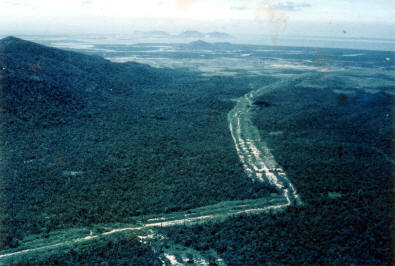 Contact: 0840H at YS248791 3Pl commanded by Sgt Joe Yandall with a Vietnamese guide were moving along a track used by the VC. The guide claimed to have spotted x5 VC in an area where the vegetation changed and 3Pl set an immediate ambush to catch them. While 3Pl were waiting another x3 VC approached from the opposite direction [one leading, remainder 30m behind] and were contacted at 20m, x1 VC KIA BC [the VC was identified from documents as Nguyen Van Dac a medical orderly in the finance and economy section of either the CHAU DUC or BARIA/VUNG TAU guerrilla units.] x1 M1 carbine and a pack with documents and a small amount of medical supplies was captured. 107 Bty RAA fired a contact mission on YS253799. The original report of x5 VC was not confirmed. 1315H 1ATF advised that radio codes for the day had been compromised by the loss of an AKAC set, Task Force CP ordered all units to minimise code use until a new set could be issued. 1340H 3Pl were advised of the close proximity of US forces in block positions at YS231802, YS239804, and YS2441809 and warned to proceed with caution and apply ROE carefully. Contact: 1445H at YS244792 3Pl were moving on a track when the rear section indicated that VC had been sighted 200m away moving across swamp to one side of the patrol. 3Pl stopped and observed their arcs, after 2-minutes the lead section detected movement to the front of the patrol and contacted x2 VC at 5-metres, x1 VC KIA BC. A quick follow-up of a blood trail for 30m found a 2nd VC KIA BC, x2 AK47 and x2 packs containing x2 M26 grenades, 150lb rice, 10lb tobacco, 10lb sugar, some batteries and clothing captured. 1x VC KIA was identified as NGUYEN VAN DAC from VUNG TAU CITY UNIT. 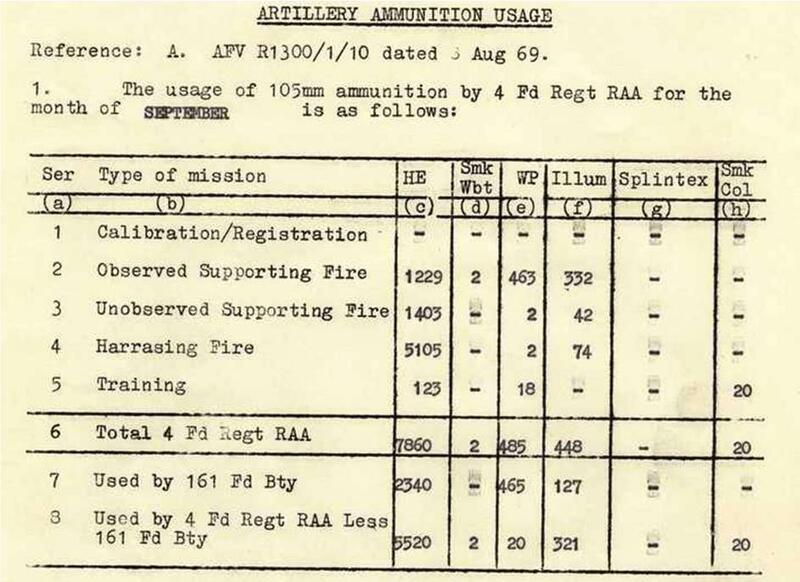 The platoon fired 400 MG rounds, 200 M16 rounds, and 150 SLR rounds. 107 Bty RAA fired a contact mission on YS247795. A LOH arrived after the contact to uplift the captured documents and deliver new radio codes but since no LP was available a rope exchange was organised. The VC originally spotted to the flank were not contacted. 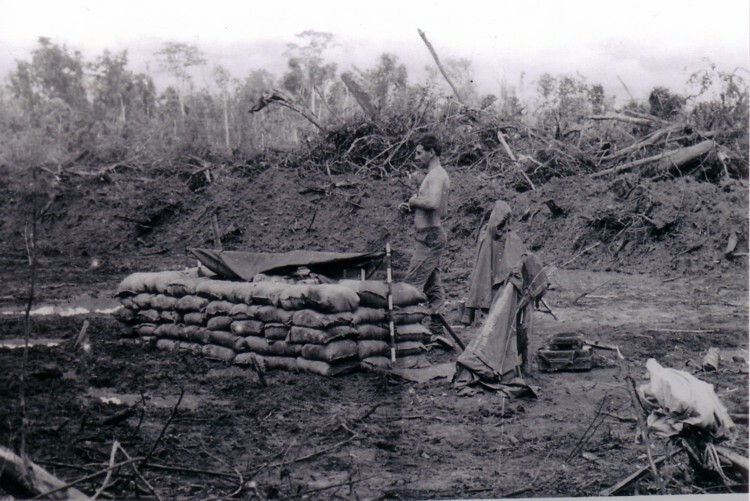 1600H 2RAR/NZ [less W Coy] concluded Op CUNG CHUNG II AND withdrew back to NUI DAT for rest and retraining. 2Pl W Coy garrisoned FSPB GAIL until 2RAR/NZ returned on 21 September. W Coy (-) continued to protect the LCT and NDP JILL. Between 9 and 21 September W Coy was again under OPCON of 8RAR. From 1610H all W Coy locstats were passed to and recorded by 8RAR [but no 8RAR records on the AWM site], however 2Pl continued to send some reports to 2RAR/NZ - more details here [but reports made after 12 Sep are not on-line]. FSPB GAIL: 2Pl had in location V Coy mor sect c/s84, sect Aslt Pnr, sect APC c/sTA31, and a section [x3 guns] from 107 Fd Bty c/sG10A. FSPB GAIL: 1515H 2Pl advised that a Iroquois helicopter had crash-landed on the road just beyond FSPB GAIL. 2Pl assisted with security until the helicopter was retrieved at 1625H - more details here. Contact: 1615H at YS268789 3Pl were crossing a stream and smelt food cooking. The lead scout then spotted a sentry at 75m and initiated contact, x1 VC KIA BC and x1 AK47 captured. A limited follow up found a VC camp with indications that it was booby trapped. Artillery was fired on likely withdrawal routes at YS275794. 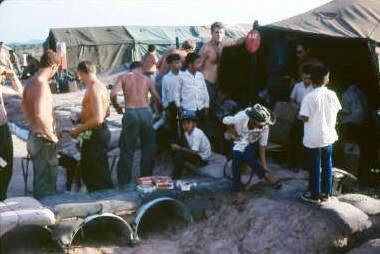 The attached engineer mini team made preparations to clear the camp site of booby traps the following day. The camp was subsequently found [12 Sep] to be 300m x 20m in an L shape with x13 bunkers and x12 fighting pits with x40 sleeping places. x5 cooking huts were identified and 23 cooking utensils located. There wer e wires deployed to control mines and booby traps and it was estimated that around x10 VC were in the camp at the time of the contact. The VC KIA was identified as NGUYEN BA MAT Pl 2ic of the Liaison Sect D65 [bit senior for a sentry, perhaps using a latrine..?]. 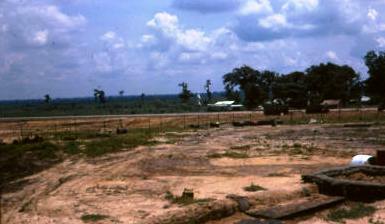 This was probably a camp for D65 VC Engr Bn. Night Location: Coy HQ NDP JILL, 2Pl FSPB GAIL. FSPB GAIL: Late afternoon 2Pl assisted with an ARVN army vehicle accident, a jeep had crashed off the road during a heavy rain storm. DUSTOFF was requested for x2 lying, x1 sitting - more details here. Contact: 1230H at YS344762 [edge of SUOI CHAU PHA river] a 1Pl sentry engaged the lead VC of two VC sighted [only one was armed], x1 VC KIA BC. Night Location: Coy HQ, 3Pl with a troop tanks NDP JILL, 1Pl YS385743, 2Pl FSPB GAIL. FSPB GAIL: 1750H 2Pl at FSPB GAIL requested DUSTOFF for x6 Vietnamese school children injured in a vehicle accident outside the FSPB. The vehicle accelerator became stuck and the vehicle left the road, more details here. Injuries were identified by 2Pl as broken wrist, arm and shoulder, fractured skull. 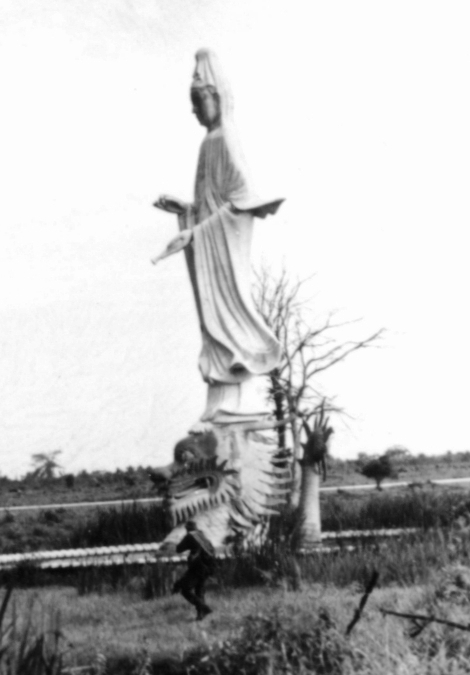 The children were evacuated to BIEN HOA. 1120H 1Pl were at NDP JILL. Night Location: Coy HQ, 1Pl NDP JILL, 2Pl FSPB GAIL, 3Pl YS294799 and YS305754. FSPB GAIL: it was around this date that the 2Pl headcount at FSPB GAIL mysteriously declined - more details here. 102H Comd 1ATF visited LCT and elements 2RAR/NZ at NDP JILL. Contact: 0830H at YS253788 3Pl were beginning to break from their ambush night location when x4 VC approached, the 3Pl sentry engaged at 30m. 1x1 VC KIA BC, x1 AK47, ammunition, 10lb sugar, 20lb rice, batteries, 4lb pork sausages, 2lb tea, 4lb tobacco, x2 packs captured. No artillery support was fired during the contact. x2 female VC escaped north, x1 male VC escaped west. The VC KIA was identified as NGUYEN VAN THANH aka SAU THANH political officer B2/C41. Sgt Yandall was awarded a Mentioned in Despatches (MID for his actions during contacts in the period 10 to 20 September. Night Location: Coy HQ, 3Pl NDP JILL, 2Pl FSPB GAIL, 1Pl YS335768. 2RAR/NZ sub-units returned to the field [into AO JUDY] from their break in NUI DAT taking over positions previously held by 8RAR including FSPB GAIL, FSPB LE LOI and NDP JILL [Bn HQ remained in NUI DAT]. 8RAR returned to NUI DAT and stood-down from operations prior to their withdrawal to Australia without replacement. W Coy reverted back to under command 2RAR/NZ. It should be noted that in the period 10 - 21 September while W Coy was under OPCON 8RAR all W Coy VC KIA were credited to 8RAR, not 2RAR/NZ. It is understood that 8RAR were happy to add the W Coy tally to their own total..! 2RAR reported the W Coy tally but did note 'while OPCON 8RAR'. 1200H 2RAR/NZ assumed responsibility for AO JUDY and OPCON of W Coy by 8RAR ceased. Night Location: Coy HQ final night at NDP JILL before being relieved by A Coy, possibly 2Pl final night FSPB GAIL. A Coy 2RAR/NZ relieved W Coy at NDP JILL. W Coy started recce and ambush operations in east of AO MANGO. Night Location: Coy HQ YS305728, 1Pl YS304734, 2Pl and 3Pl co-located at YS280736, mor sect NDP JILL. 0740H locstats were: Coy HQ YS305728, 1Pl YS304734, 2Pl YS278738, 3Pl YS281737. From 0815H onwards W Coy elements were extracted by Iroquois back to NUI DAT. [Brig RWK Ainge Comd NZ Forces Far East visited 1ATF arriving 0830H and departing 1345H after a visit to V Coy at FSPB LE LOI]. Night Location: W Coy returned from VUNG TAU and were complete in lines in NUI DAT. 2RAR [no NZ component] started a joint operation from FSPB HIRAM with Royal Thai forces - the operation was short-lived due to operating problems with the Thai forces.